Any specific instructions to the designer? 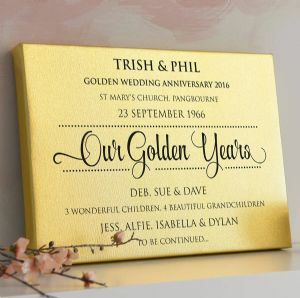 A personalised piece of metallic typographic art, made for a special Golden Wedding Anniversary, filled with memories from the last 50 years of marriage. 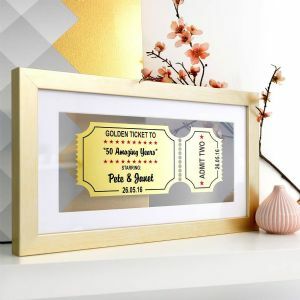 We will add their names along the top, followed by "OUR GOLDEN YEARS" across the middle in metallic gold, the perfect accessory for the golden couple! The rest of the word art is made up of all their favourite things - children, grandchildren, family, hobbies, interests, friends, special dates, places visited, favourite sayings... just about anything that is meaningful to them. 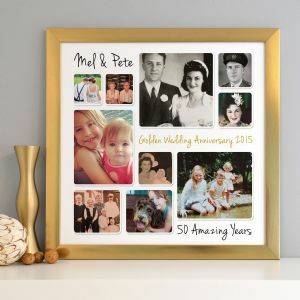 We will create a beautiful piece of art, jam packed with all of their most special memories! We recommend approximately 60 words for this design, but more or less is also acceptable. We don't out-source any of our production or framing so we can deliver really fast! See your word art before it's printed! A proof will be emailed to you to approve before your art is printed. We do not charge any extra for changes to be made to your design, you will be emailed a new proof to check, free of charge. 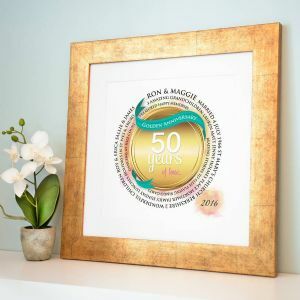 The Personalised Golden Anniversary Metallic Word Art is available in 2 finishes: Framed Prints and Stretched Canvases. Framed prints: CHUNKY/THICKER FRAME WITH MOUNT - overall finished frame measures 48cm x 48cm. Print inside frame is 29cm x 29cm. Mount is 5cm wide on all sides. Frame moulding is 5.4cm wide on all sides. LIGHT WEIGHT THINNER FRAME WITH NO MOUNT - overall finished size is 50cm x 50cm. Print inside frame is 44cm x 44cm. There is NO MOUNT with the thinner, budget frame. The thinner frame moulding is 2.8cm wide on all sides.